A 20 oz. 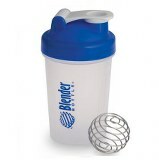 blender bottle with mixing ball. Great for shakes, omelets, and fruit drinks.